Medfield Animal Shelter News: What Happens to Imperfect Pets in the Pet Trade? Precious little Russell was almost put into the drawer labeled "Feeders" at a pet store. 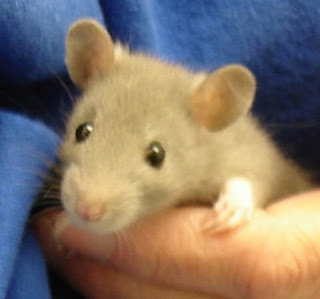 Russell was initially in the "Pet Rats for Sale" tank. But then store personnel realized one of his paws is deformed. He was being transferred to the "Feeders" Bin when a kind-hearted person saved his life. Russell is now at the Medfield Animal Shelter. He has touched our volunteers with his cuteness and his sweet, gentle demeanor and we are hopeful that this little cutie pie will soon find a rat-friendly family to love him. Many of us don't have an opinion about pet rats, or at least not a positive opinion. But once you've gotten to know one, you realize that they are sentient beings with feelings of their own and it would be nice if they could be treated humanely. Russell's story reminds us that pets for profit is rarely a good idea since guys like Russell have no value in that world, and that is very sad indeed. Oh, Kim! You write so well! I dislike rats but this piece and picture make me wish Russell the best; good luck little guy!